Water heaters are prone to leaks. Minerals in the water can create a sediment buildup in the tank. When water heats up it expands which can eventually wear out the lining of the tanks. These things can cause small cracks to form in the lining which can leak over time. If you notice a leak coming from your water heater, try to find the water shut-off valve to keep the leak from spreading until repairs can be made. Turn off the power supply to the water heater too. Contact us now for heater repair in Beverly Hills or West Los Angeles, CA. We offer preventative maintenance for water heaters to help eliminate sediment build up inside the tank. Our plumbers will also check for any signs of corrosion or potential weak areas in the system that could cause expensive repairs if not taken care of in time. For more information about our scheduled maintenance, contact our team today at (310) 454-2010. 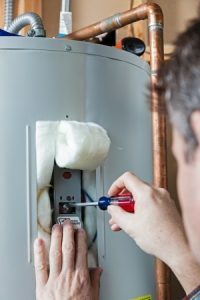 If the water heater has suffered extensive damage or does not run efficiently, it may be time to get a replacement. We can come in and remove the old unit and install the new model to make sure your system gets up and running correctly with little delay. Sunset West Plumbing & Rooter is available to service both tank water heaters and tankless water heaters. Our goal is to provide exceptional customer service and plumbing solutions to keep your home running smoothly and worry free. Updated on June 15, 2016 at 5:15 pm by Sunset West Plumbing & Rooter.